A few weeks ago, an evening walk took us down a familiar path. Jutting out from the sides of the paved walkway, brambles of blackberry bushes began showing their bright green clusters of ripening fruit. Among them, occasionally, we espied cordovan berries nearing their prime. When I caught sight of a berry, deep in color as the bay on a moonless night, I quickly would begin my pursuit to grasp the fruit with hungry fingers and yet found thorns blocking my furtive attempts. In a city as bustling as San Francisco, green space is sacred. 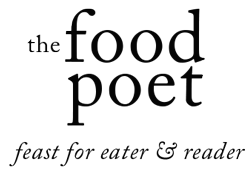 We breathe it in as our food and drink, too little nourishing our spirits and the pangs for solitude. Sometimes it’s easy to become entrenched in the busyness of living. What becomes of a weekend but a solid checklist of chores and errands? Two days of rest get filled quickly with trips to the Laundromat and the folding of socks into one another. It is too easy to let details slip by as day after day fold into the other. One day bleeds into another. A week passes. Then, another slips by quietly until somehow summer pulls her skirts up to make her grand exit. The surprise of September comes stealthily. I am not ready to let go of August just yet. I shouldn’t be surprised and yet am, again. These words came to me when the hastening of September was upon us. A difficulty exists in times of transition when one season fuses into another. September marks my calendar as a month-long reminder of dissolution from one phase of life into another. Here, the leaves begin to reveal diffused colors until at last what once was pliable and chlorophyll-rich is now dry and broken up underfoot. The sky darkens earlier, ushering us into our hovels and selves. Why does September feel like a month set aside to mark loss? I wait in September for the 11th to come and go. The anxiety of considering the power we wield over one another for good or evil can be draining. I wait for peace among men and find myself wanting. I wait for the end of the month to slowly march forward with its own personal anniversary of a birthday turned anniversary. Still the metronome keeps time. 65. 66. 67. I turn the counter each year for you, and try to imagine what you would have been like if you had continued onto old age. A Friday not so long ago, I pulled my rental car into a parking space lodged in front of a familiar bakery. As I exited the building and returned to the car, I looked up. Across from me, seated alone in the dining area of the bakery, an old man looked on me as I looked on him. His grey tufts of hair gathered like wool around the tops of his ears. Even sitting, he bore a jolly belly and bulbous nose. Sitting there, alone, what I actually saw was a phantom imprint of you at an older age. And it left me with such pangs of melancholy, I almost couldn’t tear myself from the parking lot. On a Saturday morning, we stretched and pulled ourselves awake early to make the familiar drive down to Pescadero. Our car sped along the sliver of highway that cuts along the craggy coastline as if it knew we would be embarking on an adventure and wanted to be complicit. Before long, we turned into our desired turn-off, parked the car and set off on foot to tackle the mission at hand. Some of the best things require the whole of a person and this certainly pertains to berry picking. Beck carried a cardboard flat and I noted our mission to fill it with three pounds of plump olallieberries. What started as taking the trail less traveled to the backside of the bushes resulted in discovering berries as big as the whorl on Beck’s thumb. Like children discovering a delicious game, we pulled the berries from their vines. Some of them would give to the gentlest touch and others ceded their position gingerly. Before long, we meandered down the path and up a few rows back, finding the berries, here, to be smaller and longer in size. We picked them in silence. Here, where the only sound entering this plot of land burgeoning with berry bushes, a bird call might mark the silence or the impression of wind whickering in the branches overhead. As we continued our game of hide and seek, we marred the silence with brief outbursts of our own discovery. And back into silence we would fall, perfectly content and dwelling in the moment. All that mattered was the scanning of the bush in front of us, lifting leaves to uncover that the darkest, plumpest berries grew in obscurity and shade. Too soon, our flat began to shift from the weight of all the berries gathered therein. We knew that this, like all good things, must come to an end soon and yet we kept curtailing its closure. Our steps took us closer to the car, but lingered as long as they could near the bushes and the task at hand. The meditation of looking and plucking, led to an acknowledgment of looking past what is for what might be just behind the surface. For the morning, it was our spell and our enchantment. Tasked with such simplicity of purpose, everything else fell away. The usual din of urban sounds, of the internet, of distraction to keep us from being completely present, was gone. Here, one leaf blurred into another as berries broke up the green brocade that eventually receded from our fingers. Making homemade fruit leather requires time but does not ask for great skill. Hand-picked berries do present a dilemma of wanting to decide with great care how to use them after all the time involved in picking them. 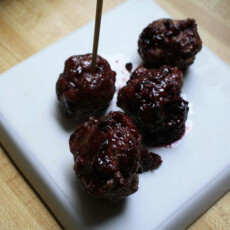 In making blackberry fruit leather fresh berries are cooked down into a new form where they might not be recognizable, save for the taste and color. This metamorphosis can be perplexing. Was the time well spent to come to this end? Is there a way I could have used them better? We brush the questions aside and grate lime skin into a small bowl of sugar, taking care to stir the sour in with the sweet. Into the receptacle of a blender we puree the blackberries, lime sugar, chile and salt that they might become one mixture. We pour the mixture into a pan where soon the bubbling purple liquid will cook down the flavors into one another. If you think of it, all of us are cooked with the flavors of what surround us. With the flat of a wooden spoon, we slide the mixture onto a parchment papered roasting pan, taking care to work the surface flat where empty spaces yet remain. Into the preheated oven the pan goes and now, we wait. And wait. I wait for your memory to be nothing but sweet. I wait for the sour to continue cooking down until I can swallow it whole. Yet, the work of drying must proceed. And I am convinced these dried eyes, this heavy heart indicate you have not fully left me. And I, like the blackberries, I too can be changed. This recipe takes about 5 to 7 hours of cooking time, so it’s a project best kept for that Sunday afternoon where house tasks have set a full plate for you. If you don’t have a Silpat mat, you can use parchment paper to line your pan. I kept the seeds in the leather as a reminder of the origins, that this indeed is fruit in roll-up form. Take heed. This fruit leather is a bit of a blackberry margarita in roll-up form and summons up memories for me of childhood summers spent in Mexico, squeezing tamarind candy with chile and lime into my mouth with great abandon. 1. Preheat the oven to 170. Line a roasting pan with a Silpat mat. 2. Stir your lime zest into the sugar. Let sit. 3. Puree the blackberries, lime sugar, pasilla powder and salt. Pour puree into large saucepan and cook on medium heat until it bubbles. Turn on low to cook and thicken for 15 minutes. Remove from heat and stir in lemon juice. 4. Draw a blackberry rectangle by pouring the thickened blackberry mixture onto the mat, starting from the center and work your way out to about 1 inch from the edges of the mat. With the flat of your spoon, edge the mixture out and work it into empty spaces. Aim for shallow depth, as the deeper it is, the longer you will have to cook it to become leather-like. 5. Cook time can range from 5-7 hours. As you check on the mixture at the 5 hour mark, you will know the leather is ready if it is a little sticky but does not leave an impression on your finger. Remove from the oven once cooked through and let cool completely on a wire rack. 6. 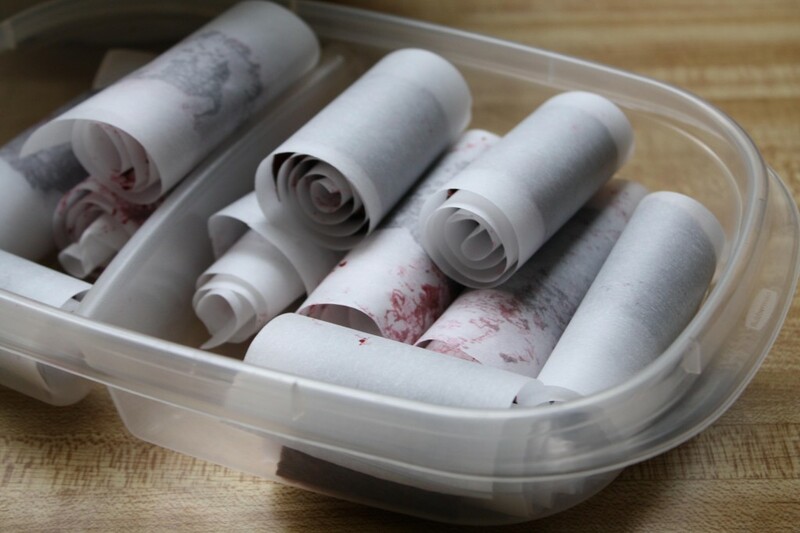 Once cooled, transfer the fruit leather to a long sheet of parchment paper and cut into long narrow strips through the parchment and leather. 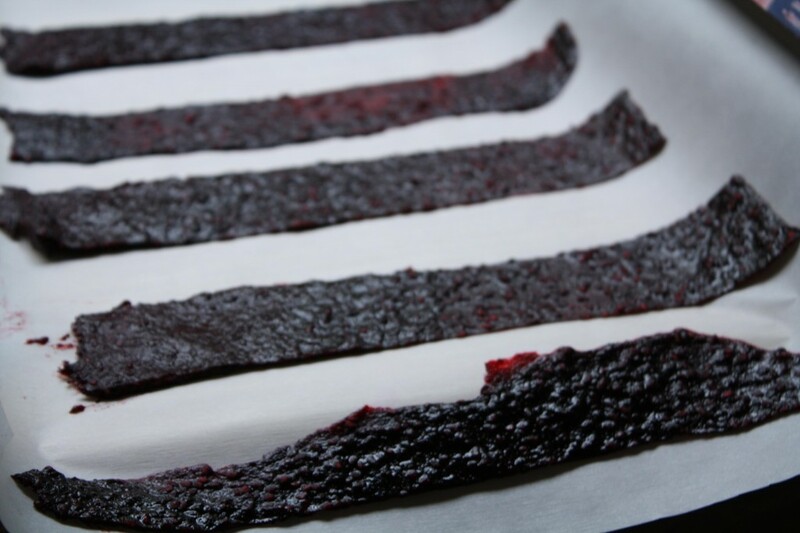 Each strip will become one long strip of blackberry chile lime fruit leather to roll up. NOTE: Keep stored in a sealed container for up to 2 weeks.